Hyde School is a significant building steeped in history dating back to 1869 and has a Category II classification listing under New Zealand Historic Places Trust. 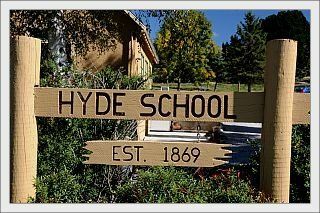 Hyde has an interesting history in the early days predominately farming and positive gold deposits successfully harvested in the 1860's. Further prospecting has been completed 2008 The railway was established in the 1890's. The railway passed through the Strath Taieri plains through Hyde across the Manitoto basin onward to Alexandra and Cromwell. This disused line has been removed and creates a corridor for cyclists and walkers (The Otago Central Rail Trail). Large clay deposits at the north end of the township are mined and used in the making of pipes and pavers and pottery in other centres. A rare 1 micron silica sand was used in the past as an important component in the manufacture of glass. A local quarry exports beautiful stone for exterior cladding for housing to Australia and the United Kingdom. The Hyde School has educated all local primary children for many generations and as time passed the rolls dropped off it was closed with only four pupils 1999. These past ten years the building has stood vacant and surplus to Government requirements. Ngaire Sutherland purchased the building in 2007 and has given it a new lease of life and it has been completely, stunningly refurbished to a high standard with a quirky modernistic internal design.